A recent motor vehicle accident in Bedford turned deadly this past weekend. In the middle of the afternoon, 911 responders were alerted to an incredibly serious accident. A car was overturned in the front yard of a home. 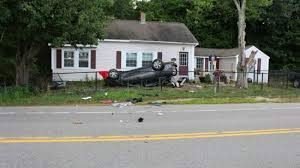 The police report stated that the the car was speeding when it struck a utility pole, propelling the vehicle through the air, over the fece of a nearby house, and landing upside down. The car had three people inside, two were ejected from the car during the crash and received grave injuries, and the third was in the car, also with serious injuries. The three were taken to a nearby hospital for treatment, and police shut dow the road for an investigation. While the three were being treated for their injuries, police identified the driver as Deng M. Chol Mabor. It was determined that he was under the influence of alcohol. He was to be charged with aggravated DWI, but something terrible and unexpected happened before the weekend was over. Unfortunately, over the weekend, one of the passengers did not survive his injuries at the hospital. This turned the case from an already complex DUI into a homicide case. In New Hampshire, DUI/DWI crimes are not normally charged at the felony level for a first offense, unless there are some extreme aggravating circumstances. The death of a passenger is one such example. Chol Mabor now faces charges of negligent homicide, aggravated DWI, and reckless conduct. Following his release from the hospital, he was taken to a local jail where he will await arraignment. New Hampshire’s considers Negligent Homicide to be a class A felony when it is the “consequence of being under the influence of intoxicating liquor or a controlled drug or any combination of intoxicating liquor and controlled drug while operating a propelled vehicle.” Class A felonies are punishable by 7 to 15 years in prison and a fine up to $4,000. Aggravated DWI in New Hampshire is typically a class A misdemeanor, however due to the bodily injuring in this case, the defendant will be facing another felony charge, at the class B level. Class B felonies are punishable by 3 to 7 years in jail and fines up to $2,000. Reckless Conduct is a broad statute that is considered when a person “recklessly engages in conduct which places or may place another in danger of serious bodily injury.” The crime is prosecuted at the misdemeanor level, unless a deadly weapon is involved. Due to the seriousness of the accident, the prosecution will likely seek a class B misdemeanor, as class A misdemeanors typically involve willful violence toward another. Class B misdemeanor charges can be punished by $1,200 in fines, and a possible loss in license. The injured party as well as the Estate for the decedent have claims against the intoxicated operator. If you or a loved one have been injured following a motor vehicle crash , contact Tenn And Tenn today. Our Injury lawyers have the knowledge and experience to assist injured parties recover just and fair compensation.